-Customization and fashion design makes this outfit appropriate for daliy,party,or other occasions. -You can't miss this attractive outfit since it's easy fitted with any other formal or casual items. -With one,you will be the focus of fashion.You can choose one according to your figure. Please trust that our design will make you more charming and fashionable. 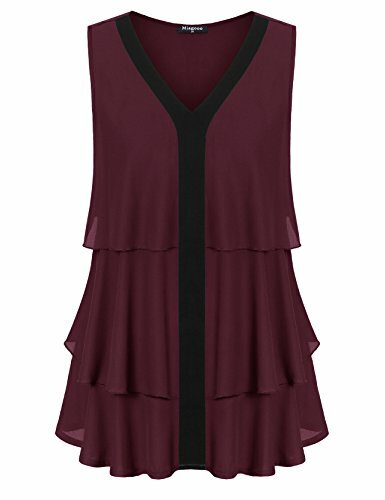 About Size Table Size:inch: S:Length--13.35--Bust--33.46--Shoulder--13.39 M:Length--13.74--Bust--35.04--Shoulder--13.78 L:Length--14.13--Bust--36.61--Shoulder--14.17 XL:Length--14.53--Bust--38.19--Shoulder--14.57 XXL:Length--14.92--Bust--39.76--Shoulder--14.96 About HaoDuoYi HaoDuoYi Focuses on design and production of Euramerican modern clothing. We have many well-experienced designers,top fabric suppliers and mature flexible supply chain. We committed to satisfy every woman from all over the world who loves youth and beauty. We always take the interests of consumers as the center,providing the most cost-effective clothing,serving for the whole world. It's our unchanged pursuit. Note Please check our size table before you place orders,and if you have any questions please feel free to contact us. We'll get back to you within 24 hours. Refer our size chart:(Not Amazon) XS--Shoulder:14.6inch, Bust:36.2inch, Sleeve Length:8.8inch, Length:29.9inch, Cuff:20.1inch. S---Shoulder:15.0inch, Bust:37.8inch, Sleeve Length:9.2inch, Length:30.3inch, Cuff:20.5inch. M---Shoulder:15.0inch, Bust:37.8inch, Sleeve Length:9.2inch, Length:30.3inch, Cuff:20.5inch. L---Shoulder:15.4inch, Bust:39.4inch, Sleeve Length:9.6inch, Length:34.6inch, Cuff:20.9inch. Welcome to our shop. Blended material, soft and comfy. 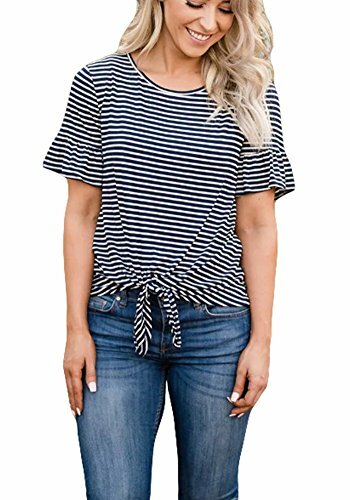 Wear it tied at the bottom or untied!We love the tie at the bottom of this casual top that buttons down the center! This relaxed fit is perfect for dressing up or down with skinnies & booties! We haven't been able to keep these in stock! Product manufacturers are stringent quality requirements made of, so this product has very good quality and in line with people's aesthetic now.Please notice that due to the display settings, pixel and other reasons, we can not guarantee that you see the color and the actual color is exactly the same product. We will try our best to make our colors as accurate as possible. However, colors are approximations of actual colors.Feel free to contact us if you have any questions about the size and fit. We are a professional apparel seller, we are committed to providing you with the best goods and service. Item type: chiffon tank topsNeck type: V-neckFabric & Care: 100% polyester/hand wash or machine wash/Separate dark color clothing from light color clothing Style: modern fashion Front style: double layers with ruffles Back style: plainGarment description: With a ruffly chiffon overlay, this cute tank shirts create a unique refined layered silhouette. The lighweight polyester fabric brings a light and airy effect in your warm-weather days. You can dress it up with skirts and high-heel for party or club. You can also wear it down with shorts and flatties at home. Notes: 1. The real color of the item may be slightly different from the pictures shown on website caused by many factors such as brightness of your monitor and light brightness. 2. Please allow slight deviation for the measurement data.Size Chart(In inches):M:----Bust--41.7" Length--28.0" Waist--40.2" L:----Bust--43.7" Length--28.7" Waist--42.1" XL:---Bust--45.7" Length--29.5" Waist--44.1"XXL:--Bust--47.6" Length--30.3" Waist--46.1"
An Amazon brand - Colorful, carefree, and creative are the words Plumberry lives by. Our selection of affordable and fresh pieces includes bohemian-inspired tops, rompers, jumpsuits, and more featuring crochet details, cropped hems, and flirty off-shoulder necklines. From school days to festival weekends to summer vacations, Plumberry Women's is your go-to pick for casual style with vintage flair. 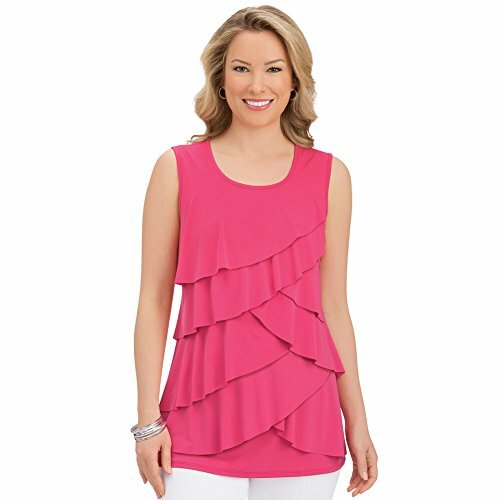 Tiered Ruffle Front Sleeveless Wide Strap Scoop Neck Tank TopDescriptionStylish ruffle front knit tank features a modern, layered look that's perfect with capris, pants, shorts or leggings. 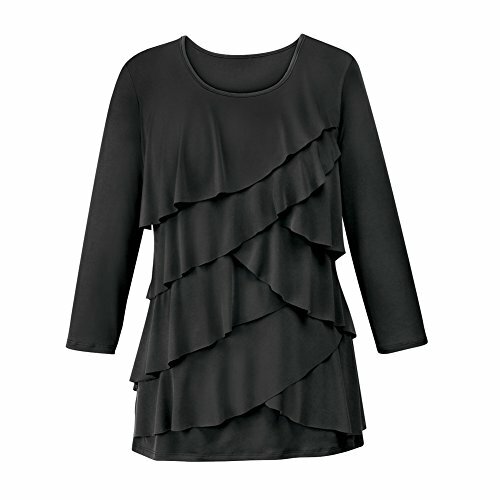 It has a flattering scooped neckline and a flowing, loose fit with multiple tiers on the front. Machine wash. Approx. 28"L. Polyester and spandex; imported. Color available in Coral or Royal Blue. Size available in M(10-12), L(14-16), XL(18-20) or XXL(22-24). About Collections Etc's Apparel Get everything you need to put a look together for the office, on the weekend, and even for date night! 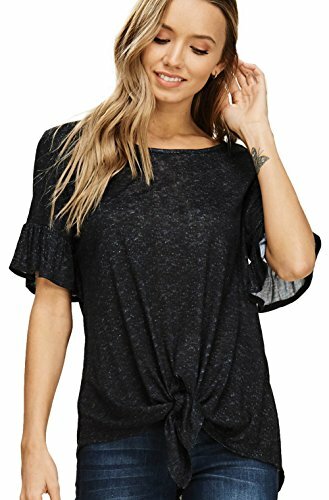 Check out our collection of comfortable women's clothing including dresses, figure-flattering tunic tops, pants and skirts, many of which are offered in plus sizes, so there is something for everyone! 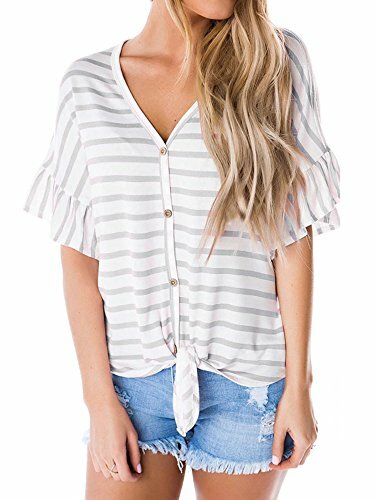 Fronage Women's Striped Bell Short Sleeve Off Shoulder Blouse Front Tie Knot Chiffon Shirts TopsS-----Bust 37.01", length-21.26" M-----Bust 38.58", length-21.65" L-----Bust 40.16", length-22.05" XL----Bust 41.73", Length-22.44"
Looking for more Ruffle Front Top similar ideas? Try to explore these searches: 2 Commemorative Coins, Imperial Bucket, and 100% Bamboo Robe. 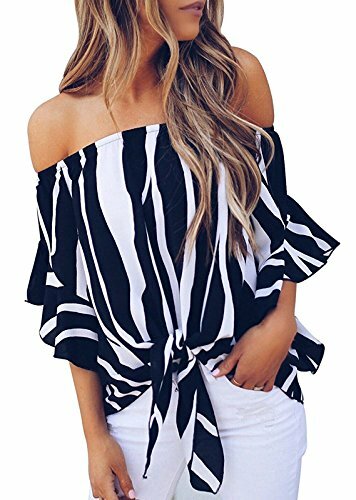 Shopwion.com is the smartest way for comparison shopping: compare prices from most trusted leading online stores for best Ruffle Front Top, White Plastic Insert, Mudcloth Print, Front Ruffle Top . 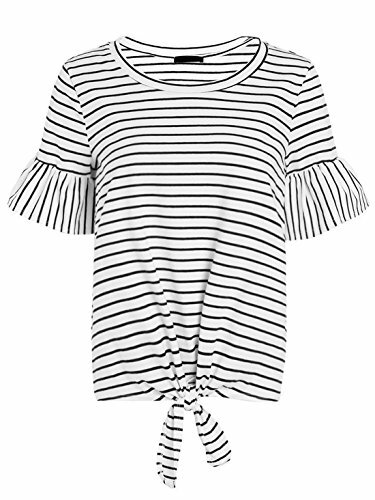 Don't miss this Ruffle Front Top today, April 23, 2019 deals, updated daily.